"Buntkicktgut" means "Colourful kicks well". It's an initiative - established in 1996 by Ruediger Heid and Memo Arikan - which uses street football (soccer) as means for the integration of immigrant kids. In the meantime its League with 150 teams and more than 1500 participants has become a respected institution that served as example in several countries in Europe. 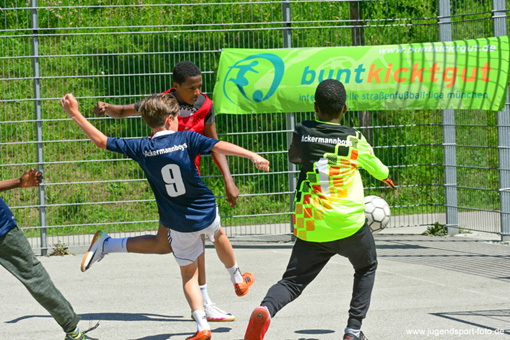 For it's efforts to promote tolerance, integration, non-violence and self-esteem within the community of young people from different origins and cultures Buntkicktgut has received awards from the German Football Association, from the Lord Mayor of Munich and from the President of the Federal Republic of Germany. The annual highlight is the "International Buntkicktgut Open". This year it took place in the Olympic Park from May, 21st to 24th . Thirty-six teams from Germany, England, Poland, Serbia, Austria, Switzerland and even two from as far away as China competed for the trophies in four categories. Important was not the victory, but fairplay and the cross-cultural encounter of juveniles from diverse backgrounds.